Here is one type of Yardage Chart to select from. This one allows a golfer to write-in their estimated carry yardage and then go out and get their actual carry yardage. It also lists 22 different clubs that helps to look at possible replacement clubs or simply to evaluate different proposed set make-ups. Estimated Yardage: First, fill-in this part as best you can using carry only at this point. What club do you hit from the 150 yard marker? Take any known distance, such as this and use it to fill in the rest of the iron spaces. Usually golfers get 8-12 yards between iron clubs (10 yards average) and 14 to 17 yards between fairway metals (15 yards average). I really like to fill-in the estimated yardage column because it proves that many of us have a tough time simply guessing how far we hit the ball in the air. 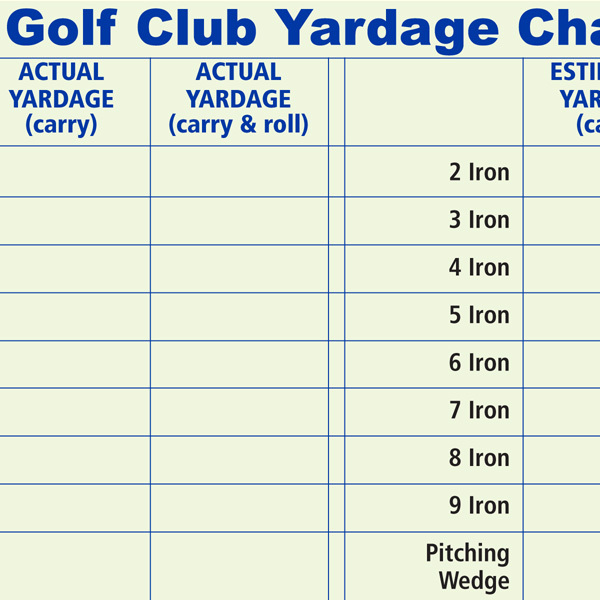 This Yardage Chart also has a column for “Actual Yardage Carry And Roll” which can be helpful in regard to the type of golf course that is played.